I was reading this blog on writing the other day, where the author wanted to know, “what do you do when you fail at writing or can’t think of a thing to write?” There was a few moments when I thought I’d write a witty, or possibly insightful comment that would be helpful to the author. Simple castle with central tower and outer curtain wall anchored by four guard towers. 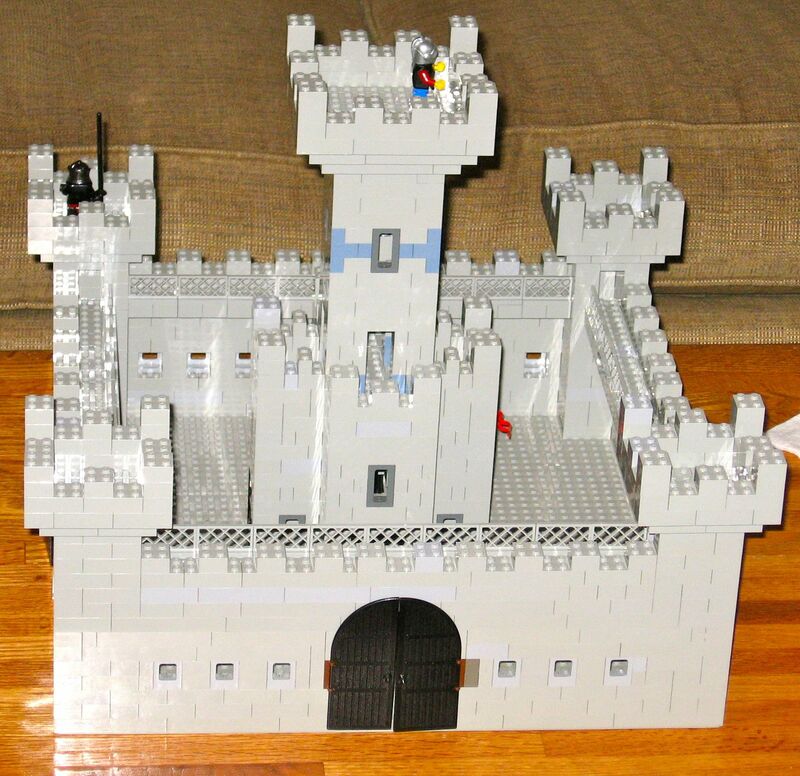 I have a rather extensive collection Legos – mostly grey bricks and castle parts. Heather has the Lego Hogwarts express and needs to buy more track. We do have other color bricks and a whole box of people. I would like to point out that this is a collection of parts we bought for ourselves – long after the children were grown and gone – and I only grudgingly allow my grandkids to play with them (they put the parts back in the wrong boxes, mess things up and try to steal our mini-figures). Usually after they visit, Heather and I will have to take a whole evening to sort out the pieces and put them back in the right containers. Kids! They think Lego is some kind of toy. Last week we went to Florida to spend some time with the grand kids and family. It was a nice vacation and we got to spend a lot of time with them. Going to Florida has never been high on my list of things to do but I found out last year that they opened a Legoland there and only a 90 minute drive from where we were staying. Plumber carrying a toilet. This is a life size model about five feet high. This is right outside a restroom. 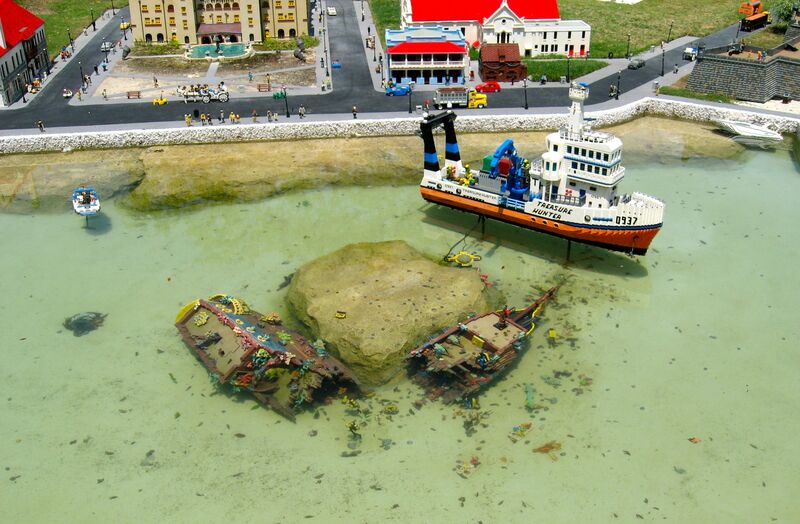 A Lego Boat recovering treasure from a sunken Lego Pirate ship. Some of you were looking for the kids in the pictures. You won’t find them – they had to go to school that day and Gran and Grandpa went to Legoland on our own, unescorted by children. 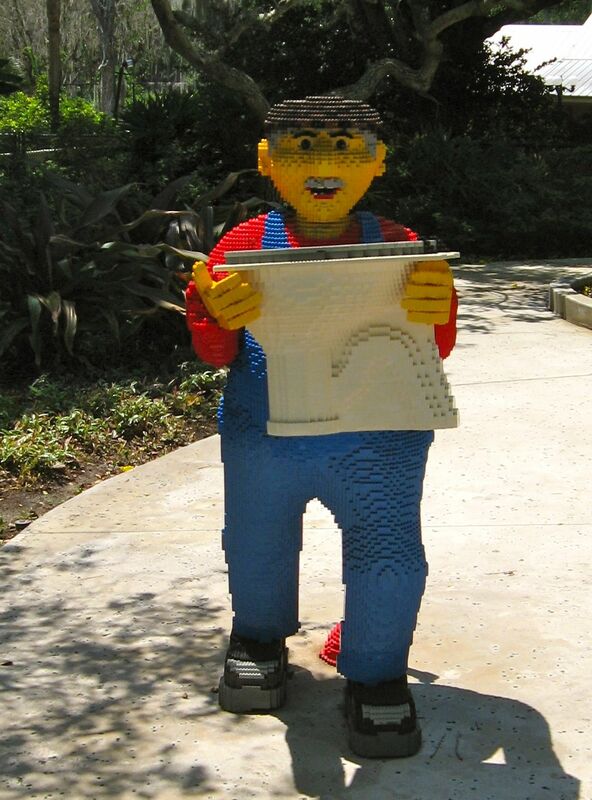 Lego is simply another media for the creation of works of art. The nice thing is that you can build some, take the pieces apart and build something else. Make a mistake? No problem, just take the pieces apart and start over. I’ve lost track of the number of different castles I’ve made, but it’s got to be going on to about 50. Sadly I rarely take pictures of them. Usually at Christmas, Heather and I will get the trains out and make a train station, signal box, water tower, etc with Lego. The adult in me wants to justify my use of Lego as just another of my many creative outlets – like marquetry, scroll saw, or other woodworking techniques. But I do have just enough kid left in me to admit that it’s just plain fun. As with all good things they have to come to an end. After Legoland we had to fly home. The flight turned into a mess as we got caught in the great American Airlines computer failure on Tuesday. The flight out of Florida was uneventful but when we landed in Dallas to get our connecting flight to California we found out that the computers were out. We were among the lucky travelers that day as our airplane was at the gate with a flight crew when the computers went down and after a five-hour delay we got to fly home. The passengers for the next three flights at our gate weren’t doing so good as their flights were canceled. Lego for grown ups – the architecture series. I wanted “Falling Water” but didn’t think we had room in the suitcase. Yes, I bought a the Lego version of Big Ben. Partly because I like Big Ben and partly because it was small enough to fit into my suitcase. The rest of the week was crazy with getting back into work, taking my brother to see another doctor(more on that next week), having a night out with friends, doing some work in my shop and trying to figure out what to write tonight. When I sat down to write, I couldn’t think of a thing to write about so I was about to go play with my Lego when I thought, “At least I could post some Lego pictures.” Well, here I am a page later with more words than I started with, all because I thought of Lego. So there is today’s writing advice: To be a better writer, buy a big box of Legos and build stuff. This entry was posted in General, Writing and tagged hogwarts express, Lego, Lego Castle, lego city, lego hogwarts, Legoland, travel, vacation, writing. Bookmark the permalink. Time to take that castle river tour in Germany! YES!!! We have to go – need to get more castle pictures for the next Lego castle creation. I was into Tinker Toys when I was a kid (around 1950-52). Never got into Lego but if they’d of had a Hogwarts Express in those days, you never know. When I was kid I got a set of Lego from an Aunt when I was about 10. Never knew about them until then. Until then I was obsessed with Matchbox cars. Remember the cars. Wish I would have taken care of them and kept ’em. Love the pictures from Lego Land. My grandson loves lego better than other building toys, where directions are given for constructing exactly what they want you to build. 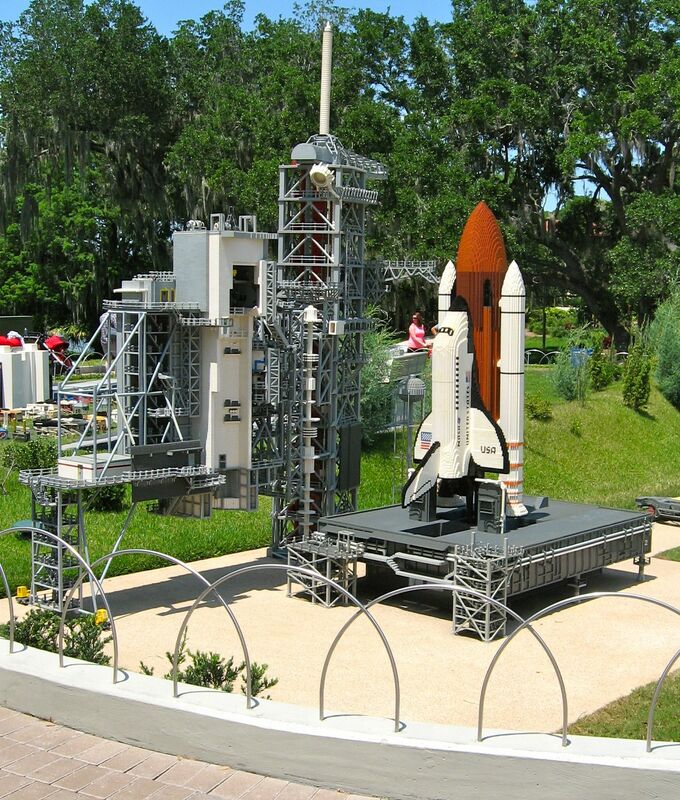 Lego gives you free reign to use your imagination and build whatever you want to build. Unless it’s a Big Ben lego set! When the grandkids come out for their summer visit I always take them to the Lego store to buy something. They carefully build it according to the instructions and carefully pack the completed model to take home. At home they tear it apart and build other stuff with the parts. I have to wonder, the box says “12+” ???? Are they worried that somebody would fall on the spire or use it as a weapon? Surely… (I know, don’t call you Shirley)… from looking at it, it dosn’t look that tough. Or maybe the Lego creators in Denmark have been tracking US test scores and have had uptick their ratings? My theory is that they are trying to make the kit attractive to us adults while still maintaining a bit of innocence. I mean a Lego box labeled “Adult” might send the wrong message to some folks. I was in Milan, Italy at Christmas time in 1978. In the toy section of a department store they had a Lego display of the Concorde. At that time it was amazing to me. In my youth I had interlocking bricks and Lincoln Logs. I believe they are around here someplace.